Rowan Heraldic Shields/Wall Plaques are popular within the emergency services covering a wide area such as police departments, fire and rescue services, Ambulance services, Coastguards and even hospitals. Within the emergency services most individual departments have their own crest/badge or sometimes coat of arms which represents the establishment itself, which can be re-produced and mounted onto a Heraldic Shield/Wall Plaque displaying the crest/badge, or in some cases coat of arms in a most professional and unique way which can be used for many different purposes such as awards, presentations, trophies, gifts, mementos or promotional and advertising purposes. 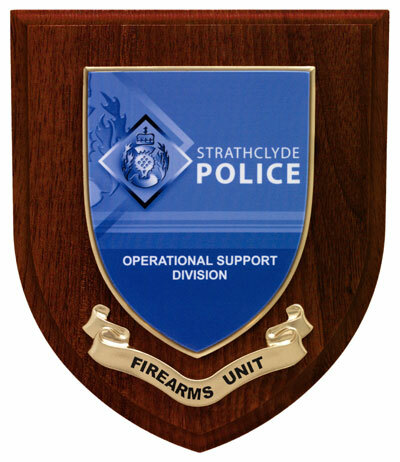 In many cases heraldic shields/wall plaques are used within the emergency services to award individuals for their special efforts and bravery, or as recognition of their achievements such as passing a course or exam etc. Rowan Heraldic Shields/Wall Plaques would be highly appreciated by any department within the emergency services providing a quality personalised product which can be used for many different purposes.